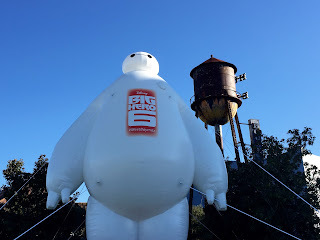 Today, my son and I had the opportunity to see a special preview of the new Disney movie, Big Hero 6. It was an event hosted by the Disney Parks Blog at Downtown Disney. One of the main characters in the movie is a robot named Baymax. This giant, 40 foot tall, inflated version of Baymax was set up right near the House of Blues. It was quite a site to see as guests walked into Downtown Disney from the parking lot.